They already have the high-powered blender, the 800-thread-count sheets, and the stemless wineglasses. And while they could always register for even more kitchen gadgetry and overstuffed throw pillows, some modern couples have their eyes on a different kind of wedding gift. What many of them want more than anything else is a house—or, more specifically (and reasonably), the down payment that will unlock the front door. A growing number of altar-bound lovebirds are rethinking the traditional retail-based wedding registry (or registries, in many cases). Some are nudging their wedding guests toward online crowdfunding-style registries, designed to accept contributions to a couple’s down payment goals. Others are quietly suggesting “money for the house” when asked about their preferred present. Either way, plenty of couples are reconsidering altogether this gift-receiving opportunity in light of what they truly need. A range of factors is at play here, the most obvious of which is the higher average marrying age—27 and 29 for women and men, respectively—than in past generations. It’s hardly a secret that many 20- and 30-somethings are temporarily sidestepping marriage while they establish careers, travel the world, hit up trivia night guilt-free, and, well, search for the right someone to marry. Then again, even some younger couples seem to think that receiving a mountain of swanky home accessories before owning a home is putting the cart before the horse. After all, you can’t feather a nest if you don’t have a nest to begin with. Twenty-five-year-old Daniel Barros and his fiancée, Traci Whiting, 24, of Plano, TX, are getting married in October. When they started thinking about setting up a gift registry, they were struck by the reality of their living situation. To help achieve their goal of $5,500, Barros and Whiting set up a registry at FeatherTheNest.com, a Florida-based crowdfunding site that allows “nesters” to register for anything from contributions toward a down payment to funds for home improvement projects. Beth Butler, principal at the site, says crowdfunded registries offer couples a way to involve their friends and family in the most important purchase they’ll ever make. Butler said that her site, which launched in May 2014, now sees 15 to 20 “nests” (as each fund is called) per month. Other similarly functioning sites—such as HatchMyHouse.com and DownPaymentDreams.com—offer comparable services, typically for the cost of a small percentage of the couple’s gift total. Rieve MacEwen, president and co-founder of Hatch My House, estimates that the monetary value of the average U.S. wedding registry hovers between $8,000 and $8,500—an amount that, if applied to a down payment (generally at least 20% of a home’s price), could certainly give a significant boost to a couple’s savings efforts. Just how helpful? When Sally and Yann Sauvignon married in 2010, they set up a registry at Hatch My House, along with two traditional retail registries. About a year after their 200-guest wedding, the couple was able to use their down payment gifts to cover the closing costs on their new home in the San Francisco Bay Area. 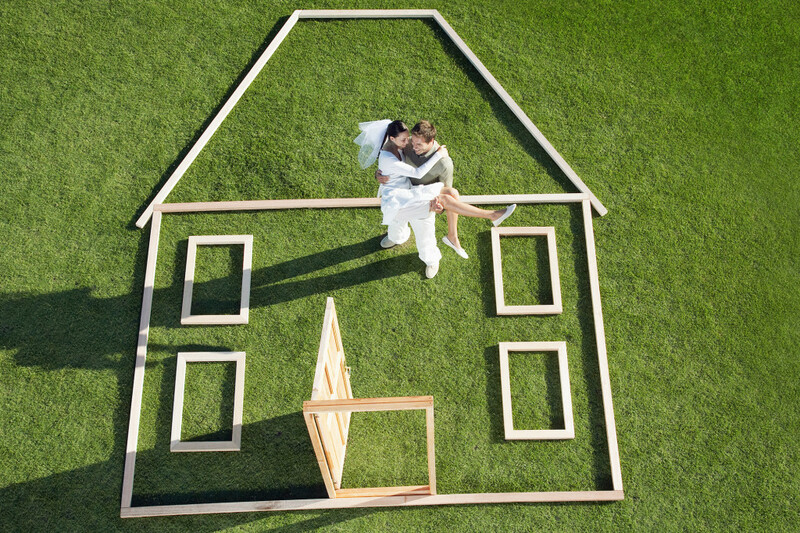 To be sure, the concept of a down payment as a wedding gift is still a bit of an outlier. The majority of engaged couples are still filling their conventional registries with flatware and “good” china. But MacEwen—who says Hatch My House has hosted roughly 2,600 registries since its founding in 2009—is confident that the next decade will see a more pronounced shift in the wedding gift tradition altogether. Don’t be sheepish. Wedding registries of any variety are simply a series of gift ideas for wedding guests who are already planning to buy a present. A down payment registry is no different—it’s just a suggestion. Spread the word. Share the specifics of your down payment registry on your wedding website, on any wedding shower invitations, and when friends and family ask where you’re registered. Be grateful. In addition to the thank-you notes that you’ll send promptly after the wedding, consider sharing periodic updates about your home-buying adventures with the people who helped make it possible. It’s just another way to show your gratitude. Leave a paper trail. When applying for a home loan, you’ll need to verify that your down payment is yours, free and clear, and not the result of another loan. Most down payment crowdfunding sites will document the nature of the monetary gift. ← My Offer Was Accepted—Now What?